Coming soon: turn your car into a hybrid | What Car? A UK company has revealed a retro-fit hybrid conversion that can potentially cut exhaust emissions by nearly 40% and improve fuel economy by 60%. 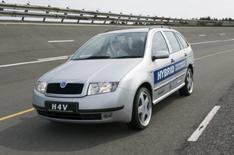 The system, developed by MIRA (Motor Industry Research Association), features a removable battery pack, arranged into three 30kW portable cassettes, that upgrades existing vehicles to hybrids. The technology is currently being demonstrated on a Skoda Fabia. The vehicle is run as a plug-in hybrid, which means it can charge its batteries using the petrol engine or by removing the battery pack and charging it through the mains. Two 35kW (50bhp) motors drive the Fabia's rear wheels, while the petrol engine drives the front ones. MIRA claims the test model returns an average of 64mpg (up from 39mpg), yet its top speed and acceleration are similar to a standard Fabia's. Derek Charters, MIRA's advanced powertrain manager, said: 'You can obtain electricity from your domestic provider far cheaper and greener than from a car engine, so plug-in hybrids make sense. However, MIRA hasn't set a date for putting the technology into production.